Another benefit of equipment leasing is you can write your payments off on your taxes! We are bad credit specialist! We say YES when others have said NO! Don't spend all your working capital buying equipment! Startup business financing up to $75,000! Bad credit ok! Minimum Loan $25,000. Credit doesn't matter because this loan is secured by equipment or real estate. Click on the button to apply for your equipment lease using our secured online form! Let us help you update your plant! Our manufacturing / industrial equipment financing programs include equipment leasing, equipment loans, and SBA financing programs! 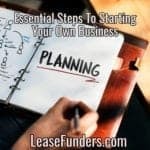 Financing your business doesn’t have to be complicated! 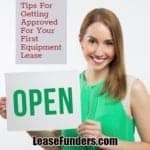 Equipment leasing is one of the best ways to have your business financed due to its flexibility in the type of equipment we can finance, low-security deposit required (preserving your working capital) and extremely flexible credit guidelines! We provide equipment financing nationwide (USA Only). Minimum $2,000 - $75.000 This program is for new businesses. From day 1 startups up to 3 years time in business. Financing for business owners with A-D credit! Minimum lease amount $2,000 This program is for business owners with A/B credit. In this program we have seasonal equipment leases! We also have corp only programs for business owners that qualify! Minimum lease amount $2,000 This program is for business owners with bad credit. There are several ways that a bad credit equipment lease can be structured! Let one of our specialist help you get approved for the financing your business needs! 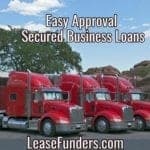 Need a working capital loan but can't qualify for an unsecured business loan? Our secured business loan isn't based on your credit! Its 100% secured by either equipment or real estate you already own! Our custom vendor programs make it easy for you to sell your equipment to your clients! Our vendors close more deals! We not only finance your A/B paper, but we can do your startup businesses and bad credit clients!